Vanilla fortune cookies dipped in chocolate and decorated with pink ribbon sprinkles. Your custom fortunes included and 10% of proceeds are donated to charity. We donate 10% of proceeds from our Pink Ribbon Fortune Cookies to the Breast Cancer Research Fund. 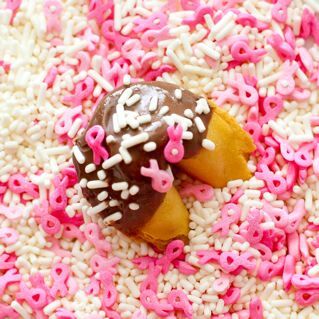 Each traditional Vanilla fortune cookie is chocolate covered and hand-decorated with pink ribbon sprinkles perfect for October's breast cancer awareness events and fundraisers! Don't forget custom fortunes -- see examples below. October is Breast Cancer Awareness month so we are introducing our Fortune Cookies For A Cure™! We will donate 10% of the sales from the Pink Ribbon Fortune Cookies™ to the Breast Cancer Research Fund. making these fortune cookies truly Fortune Cookies For A Cure™! Our traditional fortune cookies come dipped in your choice of fine milk, white or Belgian chocolates then hand-decorated with our pink ribbon sprinkles. The best part is you get to have your personalized sayings inside. • Thanks to you we will soon make breast cancer a threat of the past. • Generosity is one of your outstanding traits. • For it is in giving that we receive. • You efforts will bring hope & inspiration to thousands. • Over 200,000 NEW cases of breast cancer will be diagnosed in 2010. Donate. • By making a donation today, you can help save lives. • One in eight women will be diagnosed with breast cancer. • Fight Like A Girl! • Live, Love, Believe in the Cure! • Show You Care, Be Aware! • I Pink I Can, I Pink I Can! • Thank you for your participation in the Susan G. Komen Race for the Cure! • No one is immune from Breast Cancer. Help us in our Race for the Cure. Also take a look at our Pink Ribbon Raspberry Fortune Cookies™ and the Pink Fortune Cookies For A Cure™ as well as our Giant Fortune Cookies For A Cure™. And remember we donate 10% of all proceeds directly to the Breast Cancer Research Fund. Shipping of Chocolate Covered Fortune Cookies - Any chocolate dipped product needs to be shipped by FedEx Standard Overnight or Priority Overnight shipping. Please select one of these two methods at checkout. If these methods are not chosen then we reserve the right to upgrade your shipping and charge you appropriately. If weather and location allow for other methods of shipping, such as ground, we will ship the best way and credit you for the difference. Your Pink Ribbon Fortune Cookies were a big hit at our AAA Auto Club Group Pink Day celebration for breast cancer awareness. The overall quality and taste of the cookies were outstanding and added a very nice touch to our event. It was a pleasure working with you.